Authorities in the Democratic Republic of Congo have issued an arrest warrant for former vice president Jean-Pierre Bemba on charges of high treason. The warrant was issued Friday as government troops battled with followers loyal to Bemba for the second straight day in the capital, Kinshasha . Large columns of smoke have been spotted in the city's Gombe district, where Bemba's residence is located. Bemba has taken refuge in the South African embassy in Kinshasha since Thursday, when the fighting erupted. The battle broke out after a tense two-day standoff, in which the government ordered the Bemba loyalists to return to regular army service. The guards opposed the order, saying a team of 12 policemen assigned to protect Bemba was not sufficient. U.N. peacekeepers in the Democratic Republic of Congo evacuated over 450 people Friday from an area of the capital caught in the crossfire of the battle. The U.N. Security Council has expressed serious concern over the violence, saying they are particularly worried that it has spilled over into the civilian population. The fighting was the first clash in the capital since landmark elections last year. 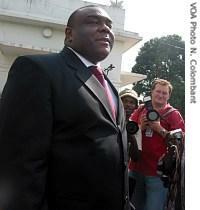 Bemba lost Congo's presidential election last year to the incumbent, Joseph Kabila. Bemba was a rebel leader during the DRC's civil war, which killed some four million people, mostly through disease and hunger. There has been no indication that U.N. peacekeepers deployed to the area this week were involved in the fighting.